When the New York City Council convened on February 15 to inquire into the NYPD’s lax enforcement of traffic laws, an overflow crowd heard stunning confirmation of what many pedestrians and cyclists have long suspected: that our lives and limbs are worth little in the eyes of the law. Last year, 241 pedestrians or cyclists were killed by drivers on NYC streets, but only 17 of the drivers responsible faced criminal charges — this while, according to the NY Department of Transportation, driver negligence is responsible for more than 60% of all crashes in which pedestrians or bicyclists are killed or injured. The ugly fact is that if you’re on foot or bicycle and run down by a car or truck, chances are that the driver will get off scot-free, without even a traffic ticket—even if he or she leaves the scene of the crash. Indeed, the NYPD will not even investigate these incidents unless the victim dies or is near death; when asked at the hearing how many criminal charges were filed against drivers in non-fatal crashes with pedestrians or cyclists, NYPD officials said they were not aware of any. January 10, 2011: Jerrold Chaleff, 71 years old; run over in a mall parking lot in the Bronx. No charges filed. February 27, 2011: 27-year old victim; car broke down on the BQE. Got out and was in front of his car when a driver slammed into the broken down vehicle, killing the owner. No charges filed. March 21, Margaret Choberka, 82 years old; crossing at the intersection of 70th Street and 32nd Avenue in Jackson Heights, a driver ran a red light, hitting the back of another driver’s vehicle which ran over Choberka. No charges filed. June 2, 2011: Leonia White, 89 years old; run over after a driver collided with pickup truck. No charges filed. June 28, 2011: Aniya Williams, 13 years old; crossing at the intersection on her last day of school, Williams was killed by a tractor trailer driver who stayed at the scene. No charges filed. July 17, 2011: Eric Bryant, driving 112 miles per hour, careens off the FDR and lands on a taxi below. Eight people are injured, several seriously. No charges filed. 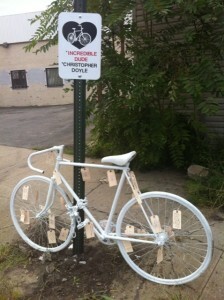 August 2, 2011: Chris Doyle, 29 years old: struck and killed by a truck driver while riding his bicycle in Williamsburg. No charges filed. August 30, 2011: Erica Abbott, 29 years old; struck and killed by a driver after trying to avoid debris in the road and falling off her bike on Bushwick Avenue. No charges filed. 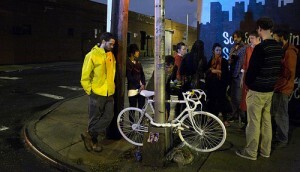 September 2, 2011: Nicholas Djandji, 24 years old; Killed by the driver of an SUV while riding on Borinquen Place in Brooklyn. No charges filed. September 12, 2011: Steven Reese, 58 years old; struck by a van driver as he tried to cross 125th St. Driver stayed at the scene. No charges filed. October 18, 2011: Mathieu Lefevre, 30 years old; struck by a flatbed truck driver on Morgan Avenue. Driver left the scene and had to be tracked down. Said he was unaware he hit Lefevre. No charges filed. 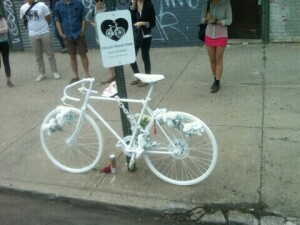 Ghost Bike for Mathieu Lefevre, 30. Killed 10/19/2011 at Morgan & Meserole, W'burg. October 24, 2011: Ronald Simpson, 43 years old; struck by a livery driver. After the cabbie fled the scene, Simpson was run over by a private sanitation truck driver. This driver stayed on the scene. No charges filed. November 4, 2011: Rev. Theauther Love, 87 years old; crossing Eastern Parkway and was struck and killed by an NYPD traffic agent. No data about speed or right of way has been released. No charges filed. The New York City Private Police Department has been known for decades to work for the select few. It angers me how blatant they are in carrying out their de-population mantra that their private financiers care so much about.